Welcome to TRACKINGSAT website. We are celebrating 21 years serving the Internet community. "Wayana Software" is the provider of satellite tracking tools for individual and professional use. TRACKINGSAT is a new conception on satellite tracking software. It is useful to assist satellite professionals, operators and domestic users that need to install your antenna and align it with the satellites in orbit. TRACKINGSAT is ideal software for Satellite Dish Installers, Ku Satellite Trucks, Portable Fly-Aways, Satellite Site Surveyors, Broadcast TV and RV DBS Owners. TRACKINGSAT computes antenna azimuth and elevation in international locations. Also, supply Magnetic Declination to world-wide locations. With him, you get with exactness the focal point (feedhorn position), F/D ratios, polar mounting declination, antenna temperature, system temperature, merit factor (G/T), Carrier Noise Ratio (C/N) and evaluate the system quality. Also, compute solar outages dates and sunrise/sunset times from your location. TRACKINGSAT transfer in Real Time the latitude and longitude from your Garmin GPS (Tested Models) equipment to city database. Also, transfer waypoints to city database. If you have a notebook computer you can to install TRACKINGSAT on it and carry it in your vehicle. The number of cities includes cities in Alaska, Canada, United States, Mexico, Central America, Bahamas, Caribbean and South America. Are +780 cities in city database. You choose your city and the values of latitude, longitude, city, state and country name are immediately showed in screen. Also, you can type the latitude and longitude of your home earth station. You can to edit city database freely and to add new cities. The number of satellites includes satellites in Clarke Belt. Are +350 geostationary satellites in satellite database and divided by International Telecommunications Union in three regions ITU. Also, you can to choose your satellite from 7 broadcast bands as C, Ku, Ka, L, S, X and UHF. All satellites are recognized by their name, manufacturer, date launch, orbit position, transponders, operation band and lifetime. TRACKINGSAT supply "Satellite Database Update" feature to update satellite database with the most recent version using an Internet connection. You can to solicit a free calculation so you can have an idea of how TRACKINGSAT works. Fill a solicitation form and receive your data by email. The email includes AZ/EL calculations, Magnetic Declination value, Satellite Link Budget calculations, Solar Outages dates. It's FREE to you ! TRACKINGSAT is 100% FREE software. No malware, no spyware, no trojans or backdoors. We wrote TRACKINGSAT because there is a serious lack of simple, easy-to-use software for satellite tracking. We also wrote TRACKINGSAT PRO, a powerful satellite tracking program that have much more features. We invite you to briefly download a FREE copy of TRACKINGSAT. 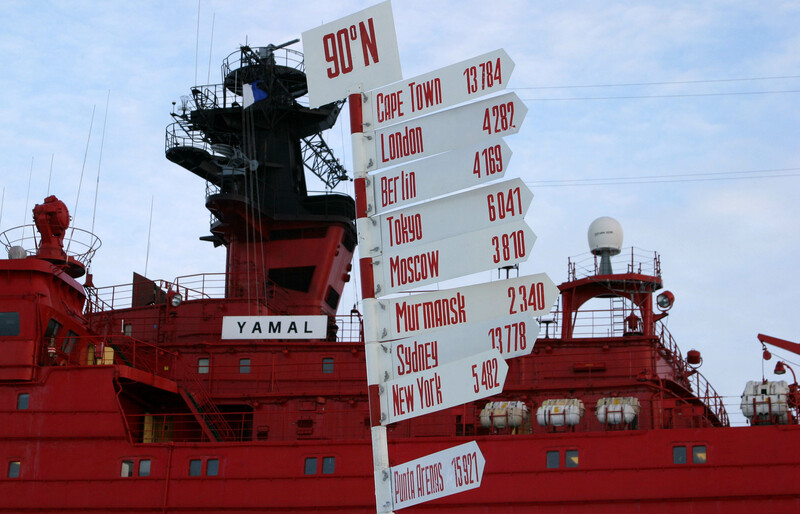 Nuclear Icebreaker Yamal at 90 degrees north on the Pole. Want to exchange links with us ? - Copy and paste the code below onto your site. - Send me your website info and the URL with the reciprocal link. TrackingSat GPS - Satellite Dish Alignment Tools - TrackingSat is a Satellite Tracking Program. TrackingSat is useful to assist users that need to install your antenna and align it with the satellites in orbit. TrackingSat - A world of possibilities. Enjoy!